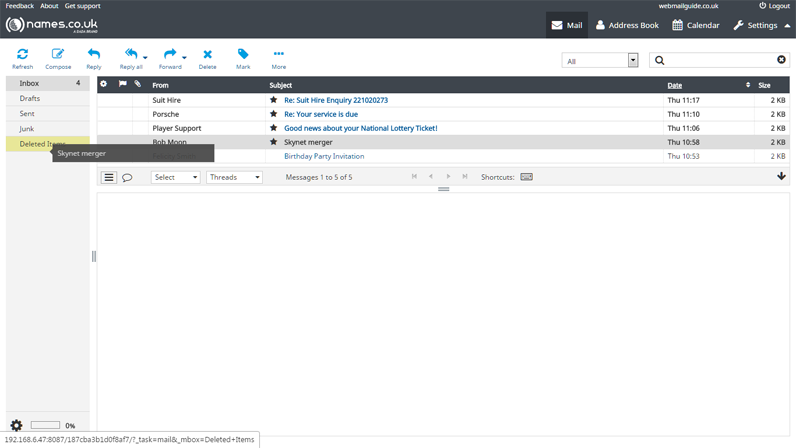 - When viewing the contents of a mail folder, you can Right-Click any message to get more options. These include the ability to mark a message as read or unread, reply to the sender, or move the message to a different folder. Several of these options are also available when multiple messages are selected. - You can also right-click on a folder and do a number of tasks, such as marking everything in that folder as read, or opening that folder in a new window. 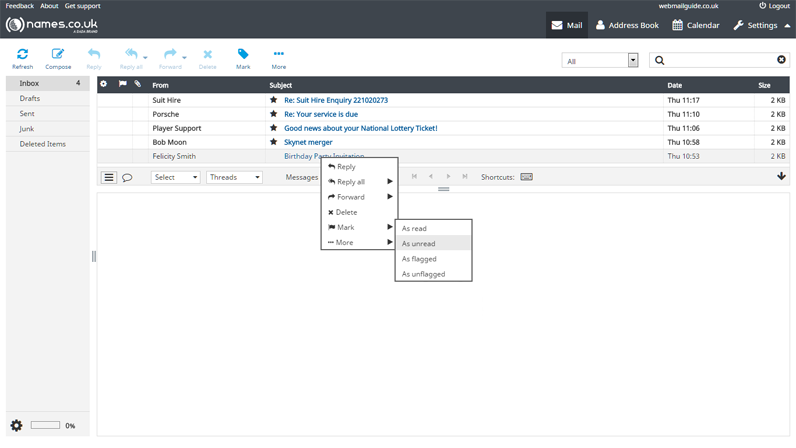 - You can drag any messages from your main inbox screen to one of your folders to the left, so whether your message is going straight to the Deleted items folder or you have created a designated folder for a particular contact, the drag and drop process makes this task very quick. - Webmail has some really sophisticated privacy settings. These include configurable anti-spam and anti-virus, the ability to black and white list addresses and other behind-the-scenes privacy protection. 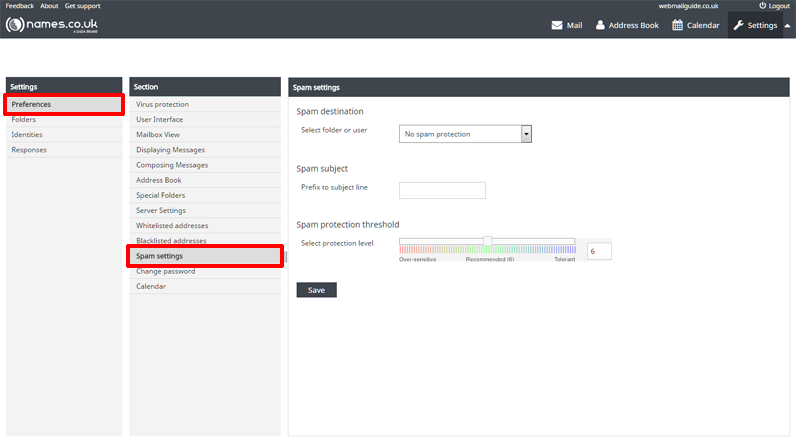 - To access your anti-spam settings, first click on 'Settings' in the top right hand corner. - Having pressed 'Settings', you will now be in 'Preferences' by default, if you're not then you can select it from the far left menu, in the column to the right, select 'Spam Settings', then proceed to select your spam preferences and when complete, press 'Save'. 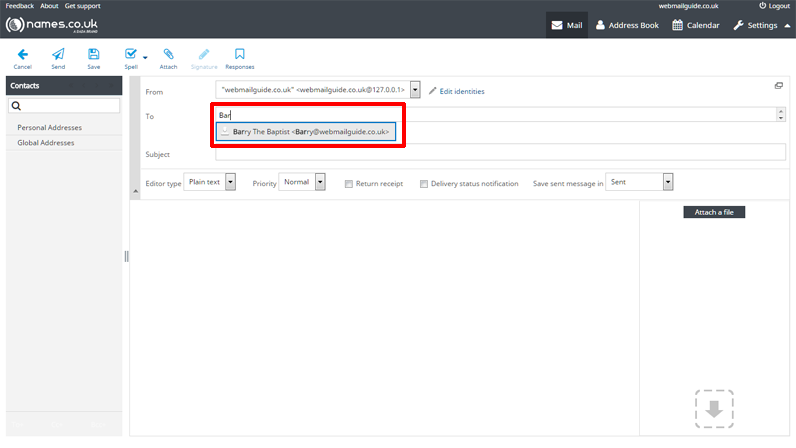 - Addressing your Email to existing contacts is made simple, as you begin to type a contacts information in the 'To' section of your message, webmail will find the contact and display this contact as an option for you to select. To select the first option is suggests, either press Enter on your keyboard, or use the mouse and click the selection. If there is more than one suggestion, you can use the arrow keys on your computers keyboard to select the contact you wish to add. 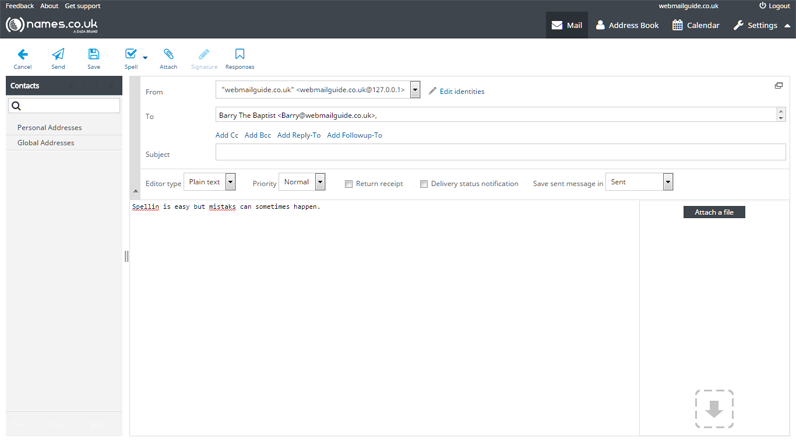 - If you have any misspellings in your Emails, Webmail provides a spell-checking facility. Any words which are incorrectly spelt are underlined in red. To see a list of suggested alternative spellings, simply right-click on the underlined word. 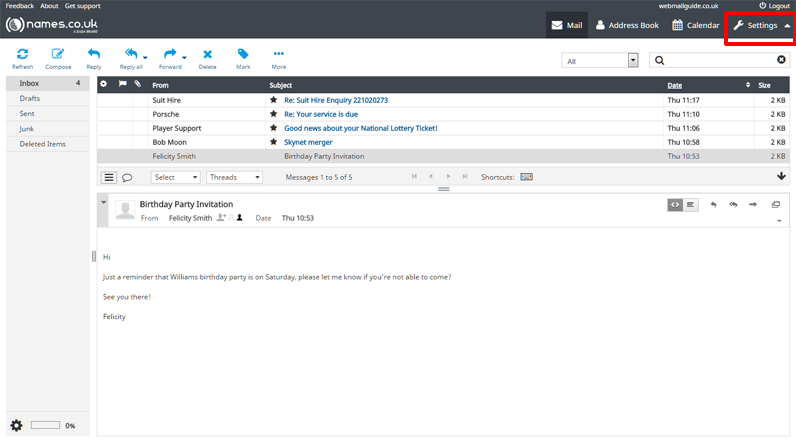 - Webmail features message threading, this allows you to track conversations with a particular subject line or conversations with a particular contact. Enable calendar feeds to automatically synchronise your webmail calendar with the calendar of another email client (such as Outlook/thunderbird etc). 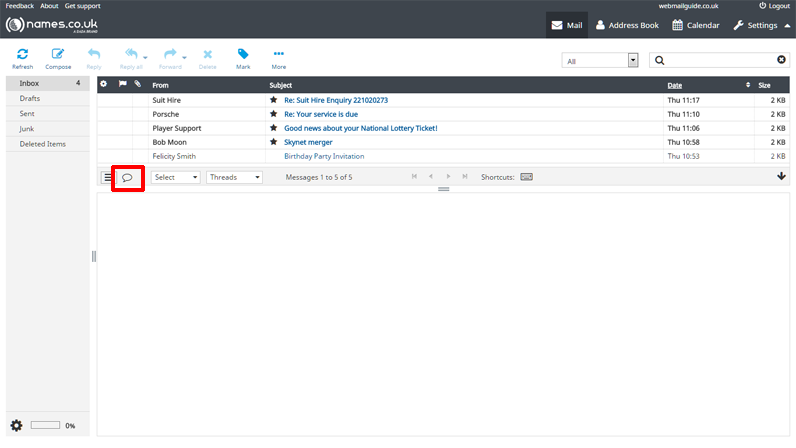 - Searching for Emails is simple. 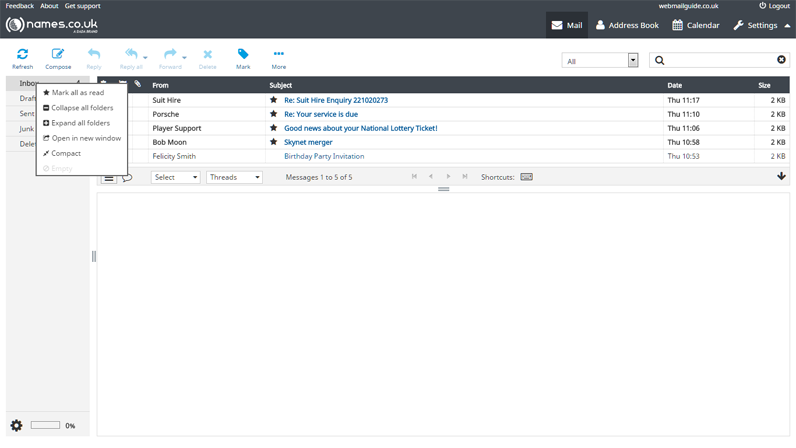 The search bar to the top right of your screen will allow you to search for email addresses, subject lines and specific words that may be contained in the body of an email. 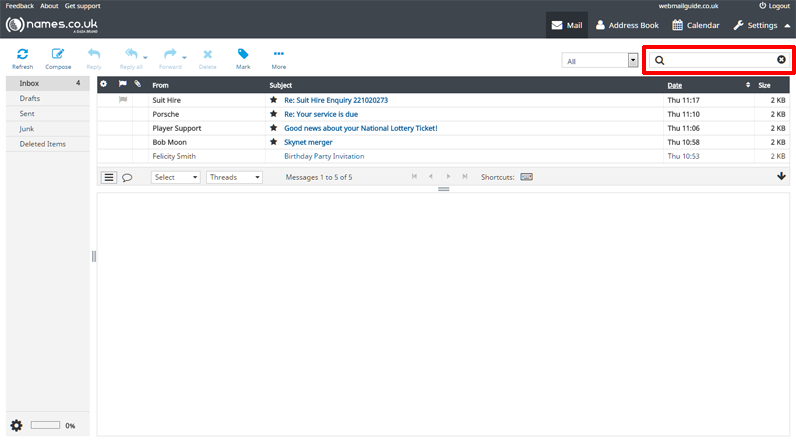 To select which parts of your messages are searched, click on the down arrow to the left of the search field in the main menu.